New Orleans, Louisiana, is famous for Mardi Gras, its lively French Quarter, and New Orleans Saints football. What you may be less familiar with is the city’s ability to consistently churn out mouthwatering Cajun, Creole, and NOLA-inspired dishes time after time. For a city that often bursts at the seams with people partying until the sun comes up, 24-hour food service is almost mandatory. After all, necessity is the mother of invention, and the New Orleans late night culinary scene is thriving. From po’ boys and gumbo to pub burgers and pizza, these 15 24-hour New Orleans restaurants will help keep those late-night hunger pangs at bay. Buffa’s has been situated at the edge of the French Quarter since 1939, and has been a staple of New Orleans, Louisiana, ever since. This bar and restaurant operates 24 hours a day, seven days a week, and provides live entertainment in the back room every night. The vintage posters, slot machines, and checkered floors provide a vintage, blast from the past kind of ambience. Buffa’s is equipped with a full-service bar, performance area, diner-style tables and chairs, and flat-screen TVs. Visitors will enjoy menu favorites that include Logan’s Run for the Border Burger – prepared with a half-pound of ground beef cooked to perfection, pepper jack cheese, fresh jalapenos, sour cream, and salsa. CLEO’S Mediterranean Cuisine is a Mediterranean restaurant situated on the border of the French Quarter in New Orleans, Louisiana. This grocery store and contemporary eatery serves up some of the best shawarma, kebabs, falafel, and baba ganoush the city has to offer. The restaurant’s close proximity to both the Saenger Theatre and Orpheum Theater make it an excellent stopping off point for a meal before or after a show. The space is equipped with wood and glass tables, black and white padded chairs, flat-screen TVs, turquoise subway tile on a few walls, and light-gray tile floors. 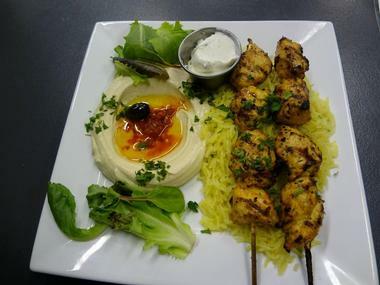 Patrons will love the Grilled Shrimp Kebab Plate – prepared with grilled, marinated shrimp, and served with salad, hummus, and pita bread. Clover Grill is a retro-style diner serving up American classics, located in the historic French Quarter of New Orleans, Louisiana. The diner has been satisfying the city’s locals and visitors since 1939 with its delicious burger and breakfast selections. The budget-friendly menu is welcomed, especially for a place that’s open 24/7. Visitors will find the atmosphere inviting, relaxed, and generally upbeat. Patrons will enjoy fun pink menus, 50s-style diner stools, and generous portions. The restaurant is equipped with gray tables and chairs, flat-screen TVs, and large windows around the front. Visitors will have to try one of the restaurant’s famous burgers, built just the way they like it. Daisy Dukes restaurant offers an incredible Cajun dining experience 24/7 in the French Quarter of New Orleans, Louisiana. Offering an authentic southern atmosphere, guests will be treated to warm hospitality, big smiles, and even bigger portions. 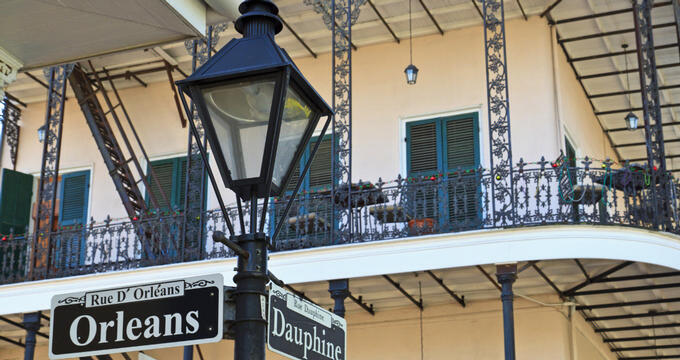 The restaurant is ideally situated around several attractions, giving patrons the opportunity to explore Preservation Hall, The Presbytere, and Jackson Square after their meal. This restaurant prides itself on continuously delivering quality food at reasonable prices. The cozy interior features dark, hardwood floors, exposed brick, diner-style tables and chairs, booths, and large, flat-screen TVs. Visitors should give the New Orleans Sampler a try – crawfish ètouffèe, red beans, rice, gumbo, fried green tomatoes, and a side of remoulade with a biscuit. Déjà Vu Restaurant & Bar is a quirky, 24-hour eatery serving ‘round the clock breakfast, burgers, and Cajun fare in New Orleans, Louisiana. This charming restaurant is housed within a historic building from the 1850s, and situated in the city’s vibrant Vieux Carre Historic District. Visitors will be greeted with warm, southern hospitality, a relaxed atmosphere, and delightful smells from the kitchen. The restaurant is equipped with hardwood floors, wood tables, red and black chairs, flat-screen TVs, and a small bar. 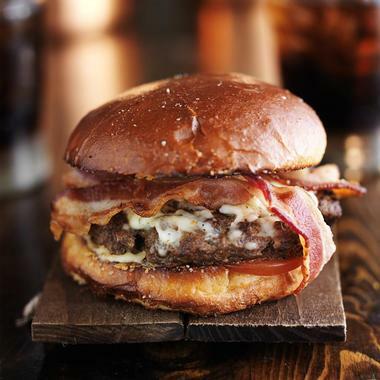 Guests will enjoy menu favorites that include the Bacon Cheese Burger – prepared with a juicy ground-beef patty cooked to perfection, melted American cheese, crispy bacon, lettuce, mayo, and tomato. DMac’s Bar & Grill is a neighborhood hotspot serving burgers, sandwiches, and pizza 24-hours a day, seven days a week in New Orleans, Louisiana. Situated in Mid-City, the bar and grill provide an excellent place for discovering local musicians and bands while enjoying delicious grub. Visitors will be treated to live musical performances every night of the week at no additional charge. Patrons will find the atmosphere to be energetic, relaxed and friendly, and filled with southern charm. The restaurant features dark-wood tables and chairs, a stage, flat-screen TVs, chalkboard specials, and a full-service bar. Guests will enjoy the BBQ Pizza – made with grilled barbecue chicken, a cheddar cheese mix, mozzarella, bacon, and barbecue sauce. 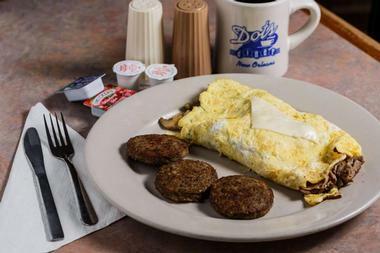 Dots Diner – by Ochsner is the kind of place people can go to any hour of the day and order up whatever they desire off of the menu. The diner is situated along Jefferson Highway, just a few blocks from the Mississippi River in New Orleans, Louisiana. 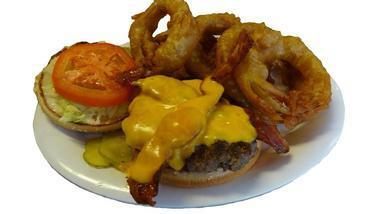 This budget-friendly, 24/7 diner uses fresh ingredients, offers large portions, and consistently delivers quality food. The staff is always welcoming, providing exceptional service, and warm hospitality. The Hit the Spot–wich is always a good choice, made with two scrambled eggs, a choice of cheese and breakfast meat. Served on either a croissant, Texas toast, or 8-inch French bread. 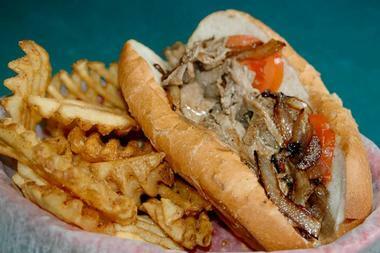 Gene’s Po-Boys is a sandwich shop situated in the offbeat Marigny District of New Orleans, Louisiana. This 24-hour restaurant’s bright pink exterior is a beacon for the late-night bar goers strolling the streets of New Orleans. If visitors make it to the restaurant before midnight, they can grab a drink next door from Curbside Daiquiris. The interior features a black-and-white checkered floor, a few small tables and chairs, steel counters, and bright yellow signage behind the counter displaying menu items. Guests will enjoy mouthwatering dishes ranging from Grilled Salmon Salad to a Chicken Patty Po’ Boy to a Ribeye Steak with fries. Lucky’s Bar is a relaxed hangout situated in a two-story house, and open 24 hours a day in New Orleans, Louisiana. The bar is located near a few of the city’s popular attractions, making it convenient for patrons to explore the nearby Buckner Mansion, Coliseum Square Park, and Margaret Haughery Statue, after their meals. The interior features laundry machines (that’s right), pool tables, flat-screen TVs, and a full-service bar. The bar provides live music most evenings during the week, and karaoke on Friday and Sunday evenings. Diners will enjoy menu items ranging from half-pound burgers to chicken nuggets to loaded tater tots. Born from Hurricane Katrina’s rubble, Melba’s Poboys has become a landmark in what was once a blighted corner of New Orleans, Louisiana. The restaurant is a cornerstone in the neighborhood, and a favorite among locals, as well as visitors. The atmosphere will make diners feel right at home; guests are always greeted with bright smiles and warm hospitality. The interior features tile floor, canary-yellow walls, wood tables, padded chairs, flat-screen TVs, several windows, and an ice-cream bar. The Fried Shrimp Poboys are a must. They’re bursting with fresh jumbo shrimp from the Gulf Coast, and served on a bun with lettuce, tomato, and pickle. Home to the 25-cent oyster, Samuel’s Blind Pelican is a popular watering hole and grill situated along the bustling Saint Charles Avenue in New Orleans, Louisiana. This bar is the perfect place for watching any sports games, equipped with 34 international and local beers on draft, a full-service bar providing craft cocktails, and several large, flat-screen TVs in every direction. Beyond the oysters and extensive drink selections, they serve NOLA-inspired pub food, gourmet burgers, and po’ boys. There’s a nice outside patio area with tables and chairs, lots of greenery from hanging plants and nearby palm trees, and even more flat-screen TVs. Guests will enjoy the Fried Oyster Po’ boy on French bread, served with a choice of side. The Alibi is situated just steps from the French Quarter’s bustling Bourbon Street in New Orleans, Louisiana. With 150 brands of tasty beer and late-night eats, the 24-hour bar is a prime location for service-industry types, night-owls, and the city’s partiers. The spirited staff is always upbeat and welcoming, and there to make sure patrons enjoy their experience. The bar offers plenty of southern, New Orleans charm, with worn leather bar stools, reclaimed wood features, and rustic décor. Guests will appreciate the full-service bar, flat-screen TVs, and exceptional service. A popular menu item is the Club Sandwich – turkey, bacon, traditional ham, American or Swiss cheese, with tomato and lettuce. The Avenue Pub is an Old-world bar featuring tin ceilings, fireplaces, and a balcony. It’s situated in the Lower Garden District of New Orleans, Louisiana. Open 24/7, year-round, the pub offers an extensive list of over 40 craft beers on draft with 31 of them rotating. The bar provides everything from vegan dishes to NOLA-inspired items to classic pub burgers. The pub is equipped with a weathered, wood bar top, exposed brick, large, flat-screen TVs, and chalkboard menus. The atmosphere is welcoming, relaxed, and full of southern hospitality. Diners will enjoy menu favorites that include the Braised Pork – Chappapeela pulled pork, ginger and mint coleslaw, Sriracha aioli, and rotating bread. 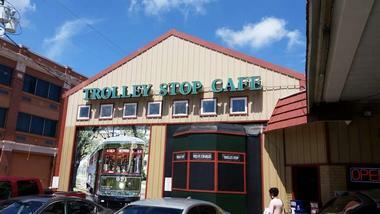 The Trolley Stop Café is a casual restaurant situated along the always-busy Saint Charles Avenue, in the Lower Garden District of New Orleans, Louisiana. This historic New Orleans landmark serves home-style dishes for every meal of the day, and is open for business 24 hours a day, Thursday through Saturday. The Trolley Stop’s warm hospitality and southern charm have attracted visitors from all over the world, and keep the locals returning. The eatery is everything discerning patrons are looking for, eclectic, cozy, delicious, and most of all, affordable. 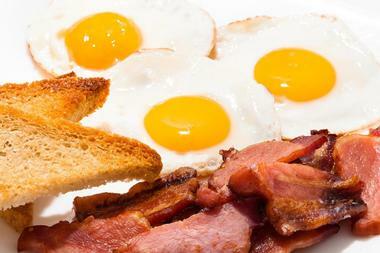 Diners can’t go wrong with the Trolley Special – two large eggs any style, two pancakes, and choice of breakfast meat. 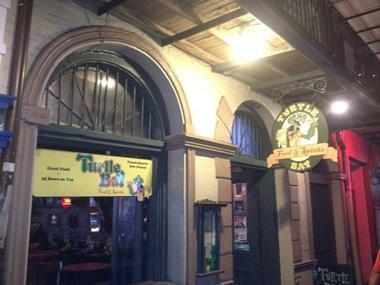 Turtle Bay is a laid-back pub and grill open 24 hours a day Thursday through Saturday, situated along the bustling Bourbon Street in New Orleans, Louisiana. As soon as visitors enter, they’re greeted with that famous southern hospitality, a relaxed atmosphere, and delicious food smells escaping the pub’s kitchen. The pub is equipped with a full-service bar for craft libations, a variety of craft beers on draft, turquoise ceilings with metal beams, several flat-screen TVs, and a few slot machines. The menu features items that range from Pulled Pork Potato Skins to Grilled Chicken Salad to Gumbo to BBQ Chicken Pizza.